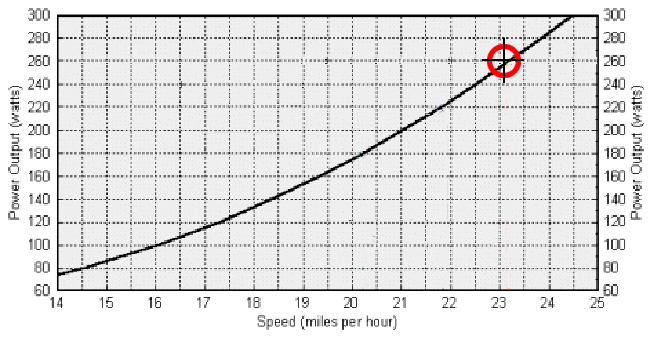 My observation of Mary's final High View hill assisted intervals (see: chat5160) identified a form break somewhere between 25.5 and 27.63 Nm. Therefore we are going to be using 25 Nm as the ceiling while moving to longer intervals, so as to allow truss muscles to catch up with the current development of her drive muscles. S/5 on the 1st Bellvale hill should put her in the 25 Nm range while gathering a baseline for further work. The goal for her Wisner 8 sec will be to avoid the 28 Nm spike she had at the beginning of her two pop-torques 07/01/10. The rest of the loop will be light speed play for general fun and conditioning. She had decided she wanted to alter her assignment with 3 Bellvale hill assisted repeats (instead of one), because S/5 was going to be too easy, so she wanted to start with M/6 and step down. I decided I had better see that, to make sure her left leg was now tracking, so I showed up during her pop-torques after the warmup. I saw right away that her leg was not tracking correctly, and the Bellvale hills confirmed how bad it was. Even while averaging only 11 Nm with a 15 Nm max (well below Thursday's breaking point), her left knee was looping out and around as her left foot remained toed-in and falling off the pedal. Although she has just recently understood the extent of harm her week left psoas has been causing (now that she can engage it slightly), it appears the psoas is still nowhere strong enough to consistently pull her knee all the way over, so her piriformis has taken on extra duties from which it continues to fail. I asked her to try pulling her left knee up extra high for the last hill repeat, and that improved tracking of the leg considerably, but she said, "That lasted about half way up before the psoas was exhausted." I followed her on over to Wisner, so I could watch her on Iron Forge and solidify my understanding of the problem. Then I got to Lower Wisner a moment before her, and when I pulled to park behind some runners, I noticed the place was packed. Runners going this way, cyclists going that way, dogs crossing the other, something happening every which way. I figured we may as well use the crowd for psych value. When she turned onto the flat I said, "Give me 33 seconds of high torque, high cadence." She did but was really disappointed when she only had a lackluster 402 watts average at the end of it. She didn't know until we got home and looked at the data why I asked for 33 seconds. The Powertap recorded a 435 personal best at the 30 second mark... before she slowed and looked down to click. Actually, she could have done better if not for freaking out and easing off when she was over 28 mph. After major success with floor exercises coupled with technical studies on the bike, plus a better understanding of the true nature of Torque vs Watts, we have Mary's bilateral functionality and spin technique is up to a level that requires a new round of closely watched efforts recorded here as an aside from the Chatterbox. We are moving tracking beyond merely watching Watts output but will instead focus training based on Torque input while maintaining a strong bias towards improving Power to Torque Ratio. In summary, we noticed some time ago that Mary could not hold nearly the same Torque on the flat that she routinely generated on hills. I theorized that an aspect of Gray Cook's cable testing technique was probably relevant to what was happening. Gray found that he could improve power output immediately (as tested by vertical jump height) by having participants in the study jump while holding cables as the outstretched their arms upward. The cables would thus exaggerate mistakes in form and give quick feedback to allow participants to learn more quickly what an efficient straight up jump was compared to an inefficient off balance jump. My thoughts were that the hills were acting like that cables, and were enforcing good technique... a mistake on a hill could cause Mary to fall, so she didn't make those mistakes. We did a series of trading off hill work with flat work comparing technique in both have succeeded in more than doubling the force with which she can push her pedals on the flat. This was done without strength work, but merely through a series of stepped technical studies which improved her position and spin smoothness. Bilateral functioning was handled through daily (numerous) floor exercise routines while bench presses coupled with pushups were used to show her the procedures for achieving true performance gains. During this time I realized that the effort required to give any number of Watts was wildly variable, and the secret to where the stability and repeatability was found through an inspection of the Torque and Cadence used. Watts can feel very easy or very hard, but Torque more or less always feels the same. The Powertap meter gives separate readings for Watts and Torque, and it is the only device available that does this at this time, so if we were not using a Powertap we would never have understood the following distinction. We have run controlled tests for more than a year, and it is very clear that a given torque at a given cadence will always give the same number of watts. Higher torque (greater effort) always results in fewer watts if the cadence is lower. Therefore we are now looking at Mary's Torque input (into the drive chain at the pedals) in order to track her improvement. Since the number of Watts she can generate are a function of cadence and spin smoothness, her Watts are more appropriately used to track broader improvements in technical skill while making predictions regarding uniformly predictable speeds achieved. Therefore, we are setting up a series of studies wherein we will piece together the effort stepping up effort on the first hill of Bellvale, then move to another baseline test on the High Point Climb Time Trial Course, followed by a retest on the Hump 1-Hr course. Her current Personal Best 1-Hr TT was accomplished with an average Torque of 8.09 Nm. That was a Cat 3 performance (plus she's had a Cat 3 for Men at 5 minutes). Subsequent to that she posted a 1/2-Hr performance on San Remo (near West Point) of 10.57 Nm. That left the closest strongman 3 minutes behind her at the end. At that time, she could achieve no more than 10 Nm for short interval bursts, and we managed to get her up near only 15 Nm, before realizing how the hills were assisting her in keeping her form together. She is now capable of 22 Nm for extended periods while the problem with going higher than that is how quickly she gets over 25 miles and hour. The speed scares her, plus the technical requirements regarding quick successive gear shifts over variable terrain breaks her concentration. These are all things to be worked on. Although we are still searching for a bike shop with the expertise required to help with maintaining and improving it, Mary finally has her equipment together—which is to say the correct gearing for her training bike... finally. Speaking of finally, this morning Mary showed me how she has finally isolated her left psoas which was the first order of business three years ago. We are moving our middle length TT's onto the High Point Climb, because of the dangerous downhill switchbacks on the West Point course. Mary yesterday completed her short (hill assisted) intervals, and the next goal is to hold 25 Nm for the entire .4 mile of the first hill on Bellvale. That would be about 750 watts given a smooth efficient spin, but we only care about her effort on the pedals at this point, so we will not yet fine tune the output. We will break the hill down into sections, find what gear equals what number of watts at what cadence, in order to backwards engineer her data readings, so she can control her effort via her watts. Torque can be felt, Watts cannot, but the Powertap only shows Watts during the ride, and Mary needs feedback regarding effort FEELS LIKE, so we will figure out what watts equals what torque and use watts as an indirect measure. Next we will go back to the High Point Climb and revisit unfinished business, which is to record a medium effort finishing just under 30 minutes, so we can start pulling sections out High Point and learning what gear should be used on each. Then we will go for a High Point personal best on and move to focus once again on the 1Hr on the Hump with the goal of bringing that up to 23+. A Kain Assault will be a diversionary aside. We have our work cutout. 05/17/08) Pop-watts at 200 due Mary still overworking starts. Also, alternate between watching averaged and current watts, because she now overworks trying to stay well over the goal wattage, instead of using it as the center of investigation and allowing down ticks before responding with more effort. Next: standard warmup with no leg pressure speed spins late in the warmup; 6 x 400 watt sprints with a 30 second goal (.BF is the starter pistol), begin adding wattage goals to all standing bridge exercises, one 3 minute interval at the next goal wattage for the Fort De Soto 16 mile test loop. NEXT 2 Next next: pyramid intervals based on 02/17/08 above.